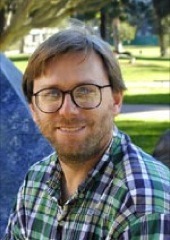 Dr. Dar Roberts is a Professor in the Department of Geography at the University of California, Santa Barbara, where he started in January 1994. He is the author of over 169 refereed publications, over 15 books/book chapters and over 100 abstracts and non-refereed articles. Research interests include imaging spectrometry, remote sensing of vegetation, spectroscopy (urban and natural cover), land-use/land-cover change mapping with satellite time series, height mapping with lidar, fire danger assessment and, recently remote sensing of methane. He has worked with hyperspectral data since 1984 and broad band sensors such as MSS and TM over the same period, as well as Synthetic Aperture Radar. More recently he has been working with Lidar. He is the UCSB Principal Investigator of the Southern California Wildfire Hazard Center and leads the group in developing wildfire fuels maps and mapping fuel moisture using remote sensing. Courses he teaches include Land Surface Processes, Historical Geography, Spatial Environmental Modeling, Measuring our Environment, Environmental Optics, and Advanced Remote Sensing in the Optical (214a) and Microwave (214b).